Sohini Banjare, a Mitanin Trainer in Ambargarh Chowki block, Rajnandgaon, Chhattisgarh has been advocating regular consumption of Iron Folic Acid (IFA) tablets by pregnant women for years. 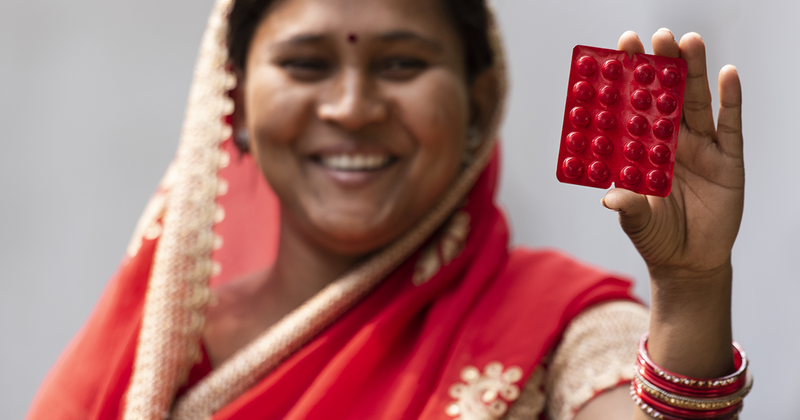 “The side-effects of the iron supplement and the stigma related to having any medicine during pregnancy has been a big barrier to my work,” shared Sohini. She recalls one particular case from 2017 to demonstrate this. “Sangeeta Mandavi belonged to a loving and supportive family in Thetwar Lanjhiya and was expecting her first child. When I came to know about Sangeeta’s pregnancy, I visited Sangeeta’s house,” recalled Sohini. A Mitanin’s visit to a pregnant woman typically involves counselling the woman about her health, update her on the government schemes and entitlements and remind her of the check-ups she must get. These visits are also meant to keep a check if everything is alright in this delicate stage; ensure she is getting adequate rest and optimum diet but most importantly, to ensure she is consuming the IFA tablet regularly, which goes a long way in ensuring the health of the mother and her child. Sangeeta’s husband and in-laws were very supportive and assured that they would take good care of her and Sangeeta herself assured Sohini that she’s taking the IFA tablets regularly. “One tends to think that it’s easy to pop a pill which ensures good health for the mother and child. However, women often discontinue it due to the side effects such as vomiting which accompany it in the initial days until the body gets used to it,” shared Sohini. “Closer to her baby’s delivery, a neighbour’s child playing in Sangeeta’s room was seen with some tablets. Soon her family discovered a heap of IFA tablets discarded under her bed,” shared Sohini. “It turned out that Sangeeta had been throwing away the tablets under her bed as she could not bear the side effects when she initially started taking the tablets,” she added. Sangeeta had hidden this from her family fearing that they may insist on her having the medicine. A week later, Sangeeta delivered a low birth weight baby (2 Kgs) and faced a lot of weakness herself. In January 2018, Digital Green entered into a partnership with the State Health Mission in Chhattisgarh under its USAID funded Samvad project. The project seeks to address Family Planning, Maternal Child Health and Nutritional goals through a participatory approach, using locally relevant content created by, of and for the communities. The program is being implemented on a pilot basis across 2 districts of Chhattisgarh, namely Rajnandgaon and Kawardha, through the State Health Resource Centre. Digital Green trained Mitanin Trainers (MTs) to produce and disseminate the videos using pico projectors. 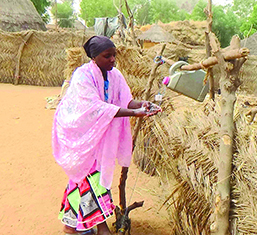 These MTs have reached nearly 41,000 women (up till Dec 2018) with community videos on themes such as IFA supplementation, Complementary feeding, Diarrhea management and Family planning messages. 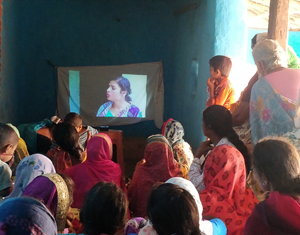 In March 2018 Sohini received training on video-based approach from Digital Green. The Mitanin Trainers were also given a pico projector to disseminate videos on various health topics to improve awareness of the community. The Mitanin Trainers would use these new tools to bring all pregnant women and new mothers together to disseminate these videos. In April 2018, Sangeeta was pregnant the second time and Sohini made it point to invite her to the dissemination of video titled – Importance of IFA tablet. The video illustrated in great detail a woman’s hesitation in eating the supplementary iron tablets due to the side effects in a dramatic and emotional manner. After the video was shown, Sohini invited Sangeeta to talk about her experience of taking the tablet and then discontinuing it. Sangeeta shared her struggle with the side effects and hesitation in taking the medicine and the consequent problems of having a low birth weight baby. Sangeeta resolved, “I will not make the same mistake again with my second pregnancy. I will follow all the suggestions as shown in the video to combat the side effects.” Sangeeta’s second child was born a healthy baby of 3 kgs.